Recommended to: Lovers of gritty, dystopian fiction with vivid characters and situations. As Partridge's resolve weakens, Pressia and Bradwell continue piecing together the clues left to them from the time before the Detonations. It is their hope that they will be able to heal the Wretches, and free them from their monstrous fusings and the Dome's oppression once and for all. But everything depends, too, on Partridge. Separated by distance and history, can they still trust their friend and ally? Or is the world doomed to an eternity of war and hardship? It's taken me quite a while to settle down enough to write this review. If you've been following me for any length of time, you'll know that I have a lot invested in this trilogy. Pressia, Bradwell, Partridge, El Capitan and Lyda have come to feel like family to me. Their broken world a place where I felt at home. Julianna Baggott has never ceased to amaze me with how easily she weaves a story. My expectations for this final installment weren't just exceeded, they were shattered into tiny, bite sized pieces. There is so much character growth in this story that I can't even begin to explain it all. Every person is faced with a choice. The type of life altering choice that has the power to make you, or break you. It was so completely heartbreaking watching as these young people, these characters I had come to love, were faced with so much suffering and despair. It was also beautiful in a way. Baggott shows how much strength there is inside each and every one of us. 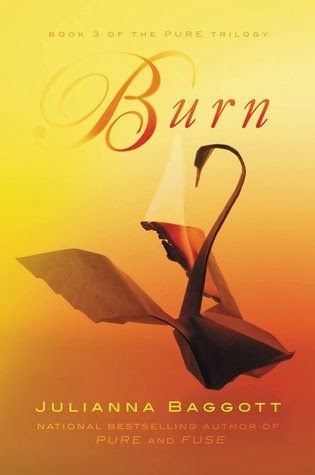 As the final book in the trilogy, Burn had a lot to wrap up. When last we left Pressia and the others, everything was in flux. People dying, secrets being uncovered, and absolutely nothing was what it seemed. The plot moves at a manic pace, mercilessly dragging you along as everything falls to pieces. I've felt battered at the end of a book many times before. I've reached an ending, and then been unable to process anything else for at least a few hours. This book? The feeling was ten-fold. I felt so emotionally hurt that it was almost physical. That being said, the ending is definitely not one a lot of people are going to like. Even I can fairly admit that it wasn't what I wanted. In terms of the overall trilogy though? I think it was perfect. It wasn't the ending I expected, but it was the ending that was needed. I can't express to you enough how much I'm going to miss these characters. This trilogy stole my heart, and I don't ever want it back.